They’re building a new house behind the office where I work. As I looked out the window this morning while waiting for my coffee to brew, I realized that it made me nostalgic for the time we had our house built in Washington. It was a fascinating and exciting experience watching our home come together from a piece of raw land to the finished product. Not everything went perfectly, as things rarely do, but we were thrilled to watch it going together and even more thrilled when it was complete. We built our house after a tree fell on the house we were renting. It was quite a journey and nearly two years between the falling tree and moving into our newly-built home. We had stayed with a couple of friends for a while, looked and looked and looked for a house, made an offer on one house that fell through, moved a family of 5 into a small apartment while still having most of our belongings in storage. I wish I had kept a copy of that poem. It was something about a home being more than the sum of its walls and doors. The poem won second prize, which was high-quality, custom mini blinds for the winner’s whole house. We didn’t have a house at that point, but it gave me hope. I knew that, whenever and wherever we found a home, I had won mini blinds for it!! I felt like God had heard my prayer for a home of our own and this was sort of a down payment on that home-to-be. I called the radio station to let them know we didn’t have a house quite yet, and they and the mini blind company were gracious enough to extend the deadline to claim the prize. One of the first things I did when we moved in was to order our mini blinds! A few years ago, I found my “wish list” for a house that I had written not long after we had to move out of the tree-damaged rental and early in our house search. It was amazing to look at that list and realize that our Washington house had hit every single thing I had written on that list. No wonder it felt so much like home to me. I’ve driven by our home a couple of times when I’ve been in Washington. I still think of it as our home. It looks much the same, with only the trees and shrubs taller. The neighbor told us that the “new” owners have paved the driveway. I wonder if our names are still in the concrete where we wrote them in the wet cement of the just-poured foundation. When we were back in Washington for Christmas recently, we had lunch at the pizza place owned by our former neighbors. It’s interesting to me that every single member of that neighboring family still refers to the house as “your house.” We sold the house over 12 years ago. We’ve been told quite a few comments such as, “They taking good care of your house for you,” and “They paved the driveway up to your house.” I guess we’re not the only ones who still think of it as our home. I’ve written about what our journey has been since we sold that house, how difficult it was for me to leave Washington and how unsettled and “home-less” (not “homeless”; “home-less” – without a home) I have felt since then. The small one-bedroom apartment we now rent simply doesn’t feel like home. It’s dark; it doesn’t get much sunshine because of the trees surrounding it. None of the furnishings belong to us. A lot of our belongings are still housed in boxes. It’s temporary. Asheville, in general, feels less like home to us since our daughter and her husband moved away, too. I miss the house that we built in Washington mainly for the reason that it felt like home to me, something I haven’t felt for a very long time, not since we moved from there. It felt like my haven. It was a place filled with sunshine and baking and projects and laughter and game-playing and studying and traditions and friends and family. It was the home filled with the beautiful, sunshine-y presence of our precious Jason. Those were the things that made that house our home. I miss that true feeling of being “at home.” I don’t know where that is or how to find that feeling again, but I hope to find it some day. Missing my boy, today and always. My dad died 31 years ago today. It was not unexpected, but that did’t negate the feelings of finality of such a death. Although I had had several months to get used to the idea that he was dying (he had gone in the nursing home in August of the previous year after several strokes), it still felt like a shock to me. Seeing my dad in that coffin took my breath away, just by the pure realization of finality right in front of me. When someone dies, you no longer have the opportunity of resolving differences, creating new memories, or just sitting and talking. Everything you had together was in the past; there is no future with that person. I’m a lot more like my dad, personality-wise, than I am my mom and I was closer to my dad than my mom. I tend to be independent, stoic, never ask for help. My sister is more emotional and relational like my mom was. Jason was a lot like me. Anyway, I’ve been thinking about my dad today. I wish my kids had had a chance to know him better – maybe a younger version of himself before he was so ill. They were quite young when he died. They really would have loved really knowing him. We lived a long way apart, so we didn’t get to see them much. Distances are hard on establishing or maintaining close relationships. When I was young in the early 1970′s, my father would take me fishing and hunting with him in Wyoming. We spent lots of time around LaBarge Wyoming. On Sundays, as we drove along beautiful rivers and streams near the Salt River Range and the Wyoming Range, my dad always found ‘The Singing Knudsens’ on the radio. I believe it was KMER, the radio station out of Kemmerer. We thought you guys were great. I remember thinking how brave you must have been to sing on the radio. I think about those times a lot because I was very close to my father. Those were such incredible times. I was just thinking about LaBarge, my dad, and listening to the Singing Knudsons. I searched the internet and found you here. I have three sons of my own now. I was truly heartbroken when I read your story. I can not imagine losing one of my boys. I wonder if I could even survive it. You and your family will always be very special to me. I wish happiness and love to you and your family always. Thank you for bringing much to mine. I was so thankful that he took the time to share these memories, even though it was so many, many years later. A fellow blogger, Melanie DeSimone, recently wrote a post entitled “Child Loss: Helpful Tips for Interacting With Bereaved Families.” One of the tips was: “It’s never too late to reach out. NEVER.” So true. No matter how many years it had been, it was so nice to hear these memories of my dad and for Peter to let me know that he remembered. Let people know you remember their loved ones. It could mean the world to them. About six months after Jason died, one of my husband’s contracts, a large chain hotel in downtown Seattle, offered us employee rates to stay at one of their resort hotels in Hawaii. It was a very kind and generous offer, one which we desperately needed and could not have afforded otherwise. I have not flown much at all in my life. As a matter of fact, my first flight ever was when Joe and I got married and went on our honeymoon. Flying usually made me very nervous and was a stressful experience, but I realized as we took off from Seattle to go to Hawaii that I wasn’t afraid or stressed at all. I realized that I no longer feared death. If I knew that if I died, I would be in heaven with Jason, and that would be a much better place to be. I haven’t felt at home or connected to any place at all since Jason died. I know that I am just passing through and one day I will truly be at home. And I can’t feel at home in this world any more. 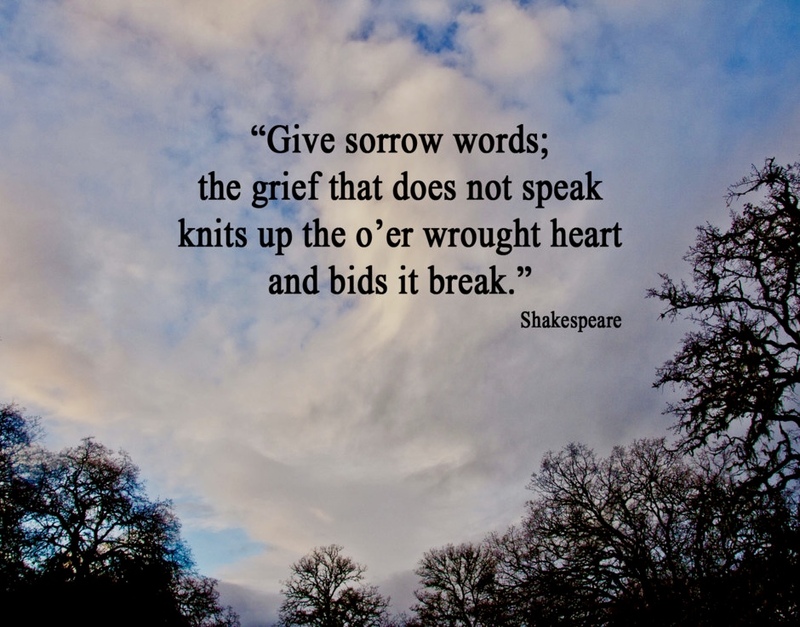 If you are a person of faith, this post has some excellent suggestions on how to help a friend who may be grieving.